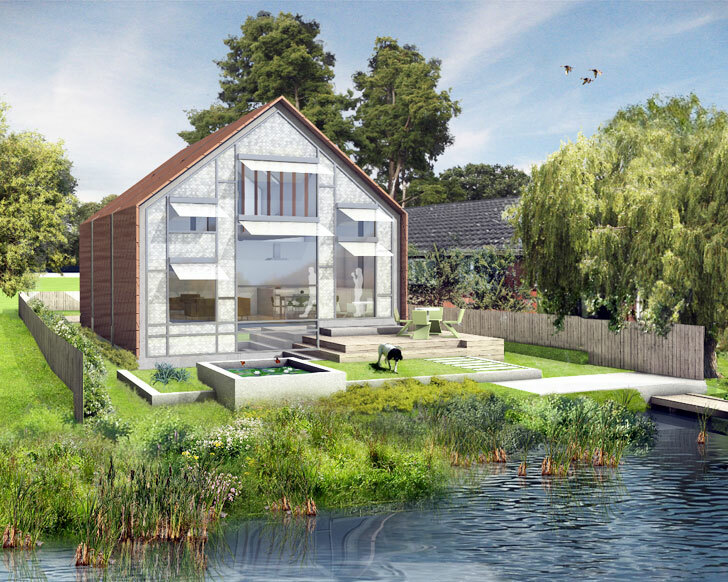 Baca Architects was recently granted approval to build the UK’s first amphibious house on the banks of the Thames River in England! The test home will respond to the issue of rising floodwaters – a pressing world-wide problem caused by climate change. When faced with rising tides, the modern home will rise and float, keeping its occupants safely out of harm’s way. The comfortable 738 square foot home will be built adjacent to the river’s shoreline, with only 32 feet of clearance should the waters rise over their normal levels. The Baca team conducted years of research to come up with a model home that would respond to flooding conditions and work with the flood to protect the home. The firm is a leader in waterfront architecture, and this an ideal site upon which to develop a flood-resistant home. During dry times, the home will rest on fixed foundations that will keep it in place. But if flooding should occur, the entire structure will rise up in its dock, and buoy along with the flood waters. The house will be built in a flood-prone area called Flood Zone 3b, which is located on a tiny island in the Thames in Buckinghamshire. Like other homes in Buckinghamshire, the home will be designed with a traditional pitched roof and other characteristics found in homes in the region. Although it will blend in our the outside, the home will be highly energy efficient thanks to lots of insulation and high-performance glazed windows. A surrounding garden will be planted as the first line of defense against flooding, and the home will react when the water reaches a threatening level, after providing a warning message to the residents. The lightweight timber façade will rest between four vertical guideposts that will keep the structure in place and protected. The house is planned for construction later this year, and it will provide a great model for dealing with flooding problems around the world. There will be a free seminar about this amphibious house - and other live AQUATECTURE projects - at 6.30pm in London on Thurs 20th Sept. For an invitation pls contact Roger at Baca Architects on [email protected] Refreshments will be provided. First come first seated! 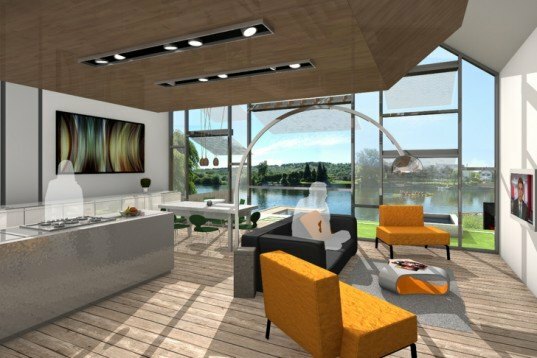 Baca Architects was recently granted approval to build the UK's first amphibious house on the banks of the Thames River in England! The test home will respond to the issue of rising floodwaters - a pressing world-wide problem caused by climate change. When faced with rising tides, the modern home will rise and float, keeping its occupants safely out of harm’s way.